One of the wonder in the world, Taj Mahal and its replica is right now in Bangalore. If you are looking for its detail then find it over here. The similar replica of Taj Mahal was in Bannerghatta Road, Bangalore, and it was last year during September 2015 if I can remember it. Yes, you may find their detail as well over here. In general, most of them would like to reach Agra, India to see live Taj Mahal but Bangaloreans' are lucky enough as Taj Mahal itself coming to see Bangalorean's every year. Great! The keyword for its search is, Taj Mahal in Bangalore, Taj Mahal exhibition in Bangalore, Taj Expo 2016, Taj Mahal in Bangalore 2016 and Taj Mahal in RBNMS college ground Bangalore etc. (By the way, I am neither favoring nor against Moghul ruler, this info is just to blog to let my its visitors' to knows that there is an entertainment place in Bangalore for School children during their holiday to enjoy it - that's it). 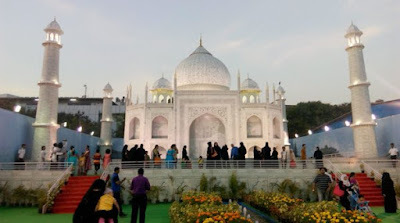 Regarding the recent replica Taj Mahal of 2016 in Bangalore, is located in RBNMS college ground, Bangalore. It is near Ulsoor or MG Road or Shivaji Nagar area. You may visit any listed time over there. The address of Taj Mahal in Bangalore 2016 is, as stated here, the best and nearest landmark is Trinity circle, you may get a Metro train for it, or you may use your own transport or city transport to reach over there. It is in RBNMS college ground, Bangalore. It is near Ulsoor area and MG Road as well. The Taj is already opened for the visitors and many family members and youth are visiting over there. As per source, replica of current Taj Mahal took 90 days to bring it to a final shape and around 150 workers done the great job. This wonderful art were made with wood, steel, iron, thermacol and fiberglass etc. Last year (2015) Taj Mahal in Bannerghatta Road, Bangaluru. Evergreen Taj Mahal in Koli Farm, near Bannerghatta National Park, Bangalore, India. Great! Thanks for visiting and adding valuable comment. It was not last year's one but the latest 2016 one. You may read this blog post again and check the last two links that updated for earlier similar topic post to know more detail about it. Hafeez, Please let me know about the timings. And also the appropriate time to visit. Thanks for visiting my blog. It starts from 11am and the best time to be there is around 3pm and on. Great Article..Thanks for sharing the helpful information...Keep sharing.,.